Our guests arrive into the event space. The area is dimmed but lit by downlights that shine onto the high cocktail tables. This creates a bit of drama in the room to start the anticipation building. There is a female dressed in a reflective costume sitting a bit above head height in a lyra. She beckons the guests to come in and welcome them as they approach. Once the majority of the guests are in, the lights are dimmed a little bit more, and spotlights are directed at her. The costume reflects dazzling light as the spot lights shine on her. 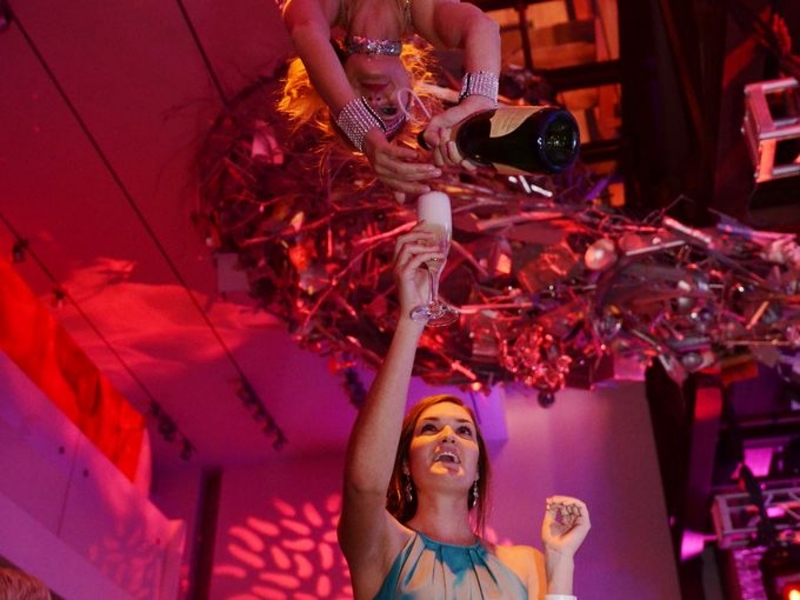 She drops upside-down and proceeds to serve champagne to guests in the area. Our guests will be surprised, intrigued and amused as this happens around them. This is a perfect photo opportunity. The music playing is rhythmic mid tempo electronica. This style implies sophistication and has a futuristic vibe that won't interfere with conversations.